Summer has arrived and it’s that time of year for travel. But if you’re using this holiday weekend for a staycation, Netflix’s Ibiza is just in time. 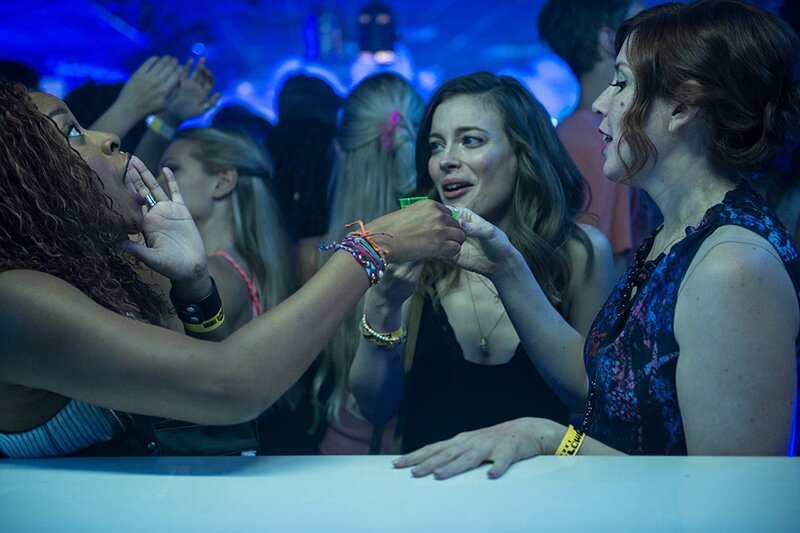 The new film about a business trip for Harper (lead Gillian Jacobs) turning into a girls trip with her two best friends (Vanessa Bayer and Phoebe Robinson) comes from Lauryn Kahn; It is based on a trip she took to Spain that she financed with the sale of her first screenplay. Although Kahn has been in the business for more than a decade, including writing and directing shorts for Funny or Die, this is the first screenplay she has had produced and released. Appropriately enough, Ibiza is bit of return home for Kahn who selected fellow Funny or Die alumni Alex Richanbach to direct the film (it is also produced by her former boss and mentor, Adam McKay). Lesley Coffin: How did you get started in the business? Lauryn Kahn: I was actually a director’s assistant, so I was around during films like Stepbrothers and The Other Guys, as well as Eastbound and Down and the Broadway run of You’re Welcome America. And Adam really brought me into his comedy world and made me part of the team. Lesley Coffin: Was that the first job you had in the industry? Lauryn Kahn: I had worked in reality TV before that. I worked as a talent coordinator and PA, worked in general casting. I felt like I worked in every area of reality TV, on shows like The Bachelor and The Biggest Loser, not to mention a lot of pilots. But that job was really the first time I’d worked in the fiction side of the business, not to mention the comedy world. Lesley Coffin: When did you start writing the shorts for Funny or Die? Lauryn Kahn: I’d always wanted to be a writer, but it felt like such a pipe-dream because I didn’t go to school for it. It wasn’t until senior that I took a personal essay contest and had that big moment and found a teacher who said I had a style. Once I moved out to LA I was still writing, but didn’t really know structure. I tried writing a screenplay but was just lost. But once I came on-board with McKay, I really found a mentor. He was encouraging me to write and told me “I think you’re funny.” I was still too scared to write a feature length film, but he told me to try writing some shorts for his new website Funny or Die. And he also helped me understand the mechanics of becoming a writer. He gave me notes and lent me books of screenwriting, and put me into UCB Improv. He was the first person to really say “you’re a writer”. Before that I had a blog in the early days of the internet where I shared my thoughts on life that I would otherwise send to friends in emails. But that’s when things really changed for me. Lesley Coffin: I want to go back to the idea of improv. We hear so much about the benefit of learning improv for actors to develop. But it’s rarely mentioned as a tool for writers. Can you think of any skills those classes gave you? Lauryn Kahn: I think improv’s really helpful for writers, especially at UCB where they’re trying to teach you to go from A to B to C. They want you to avoid going to the obvious joke and think of the less obvious joke which could have a bigger payoff. And learning improv really taught me how to build a scene and write comedic stories and characters. And even if you’re acting in a scene, you’re still creating the scene in the moment as a writer. Lesley Coffin: When you write, do you find yourself almost acting scenes out in kind of a personal improv? Lauryn Kahn: I think it’s more like hearing the characters talking to each other in the back of my mind. I find that most of my ideas come when I’m falling asleep and can almost hear the characters I’m creating living in the scene I’m in the middle of creating. It’s strange to say, but I find the characters almost take on a life of their own but come to me in piecemeal and then I have to sort through all those ideas when I wake up. Lauryn Kahn: I tend to put my ideas in my phone and I really try to be detailed enough that I won’t completely forget. But sometimes I’m half asleep and it will never be decoded. Lesley Coffin: I heard that you conceived the film after going on a trip with your girlfriends, but I assume everything that happens in the film didn’t happen on your trip. What happened on that trip that sparked this idea? Lauryn Kahn: When you travel abroad I think you have a little more freedom because you can be whoever you want when you’re away from home. And I wanted to dig into that idea a little more. But I also wanted to make a movie which would really capture what it’s like to take a trip with just your girlfriends, really show how we talk and act when we’re on our own. So the movie’s a real mix of moments that happened outside of travel, and some are inspired by other trips. But I came up with the premise after going to Spain with two of my girlfriends, although the characters are an amalgam of a couple of my close friends or people I know that make me laugh. The partying was real, the DJ character Richard Madden plays was wish fulfillment. The character of Miles was pretty much exactly like this guy I know. The cab driver Laser is based on this bus driver I had in Israel who went by the name Laser and had jerry curled hair, made alcohol in his tub, and played guitar. I remember meeting him and thinking, “you’re going to be in a movie someday” because he was such a character. The movie was ultimately a nice mix of that trip, other trip, and little moment’s I’ve observed. Lesley Coffin: Is Harper primarily based on you or did you mix yourself into all the characters as well? Lauryn Kahn: When I write, I tend to think of myself as the lead, specifically the way the character will talk. But once we brought Gillian onboard it becomes something different because you want them to feel comfortable in the part and have the freedom to grow into the character. So when I originally wrote it, there was a lot of myself in that role or characteristics I wish I had. But by the time the script was done and parts were cast, I think there was less me in that role and more of me in the other two women. Lesley Coffin: And all three of the women are experienced comedians and bring their own improv experiences. Did you encourage that approach on set? Lauryn Kahn: Absolutely. The fact that both Alex and I come from the Adam McKay camp, we both love utilizing improv, because we know firsthand that some of the best moments can come from it. And we wanted the set to feel collaborative with the actors, and once I got to know them I could see they felt the same way about using improv. What was interesting was, I first did rewrites with the actors in mind, trying to think of how they would make this line their own. But once we were filming on set, we loosened up. You always get at least one take in the can as written, but after that you can play. And that’s when you can bring out the ideas which didn’t make it into the original script, or ideas you came up with the night before or made us laugh on set. You won’t use everything, but you had a chance to try everything. And it keeps that fun atmosphere on set because everyone’s encouraged to try things, even if it’s just a kernel of an idea. Lesley Coffin: I know you and Alex are friends and have worked together before, but with this being a female lead film focused on female friendships, was there any concern about having a man direct the film? Lauryn Kahn: Obviously that’s a huge issue right now, and I can say that Alex was very nervous about that when I asked him to direct it. But I went into this thinking, I’m not at a point in my career where I feel like I’m ready to direct a feature. And if I’m not going to direct my own film, the next best thing is to have Alex direct. We have a shorthand already and I knew that we would collaborate well. But I also knew that he wouldn’t shut me out, he’d see me as a real partner and come to me when he has an idea or ask for my input on set. And knowing Alex personally, I knew that he would work well with these women and make sure they felt creatively involved and fulfilled. So for me, and I think our cast, it was never a question whether he was the right person to direct. But because it’s such a sensitive issue he was nervous and I think he felt a need to prove that he was the right person for the job. Lesley Coffin: You say you didn’t feel ready to direct. Is that a career goal you have or do you want to focus primarily on writing right now? Lauryn Kahn: If I’m being honest, directing is scary to me. There are so many areas you’re being pulled to at once and so many decisions you have to make. On this set I got to give my input as a writer, without the pressure of making every little decision. And I’ve learned a lot about directing over the years, but I’m still not at the point I feel I need to be before making that next step. So the short answer is, I want to eventually but not as quickly as thought I would. There was talk of looking for a project after I finished this film, but I’m pretty happy writing and acting as a creative producer while I learn more about the directing side of things.